Linda Hogan wrote Why we are Singing for Water- In Front of Men with Guns and Surveillance Helicopters published in YES! Magazine. This vivid article stresses the need for protecting healthy waters and explains the struggles of the Standing Rock Sioux Nation fighting for their treaty rights. Linda’s descriptive writing paints an intertwined picture of water protectors standing in protest, the Dakota Access pushback, the unity of the Tribal Nations and personal stories. 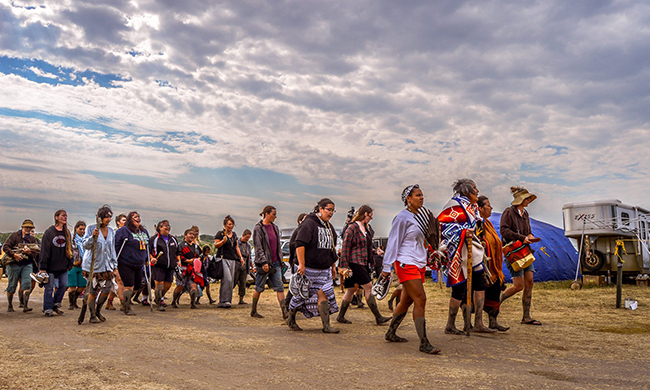 Picture: Women water protectors coming back from prayer at the Cannonball River. Photo by Rob Wilson Photography.